Most wearable technology is created to make your life a bit better or a bit easier, whether that's by sending notifications to your wrist or keeping tabs on your workouts. While wearables designed to act as medical monitors or diagnostic aids are on the rise, a number of companies are exploring how wearable technology can address the physical and psychological, complications behind addiction in an attempt to help people overcome it. The word 'addiction' is used in a lot of different contexts. People talk about being addicted to everything from Facebook and coffee through to hard drugs and gambling. But medically speaking it's when a person becomes dependent on a particular substance or activity. Addiction can look different depending on the substance or the activity and depending on the person. Often the reward of the addiction provides enough of a compelling incentive for someone to keep doing the addictive behaviour – despite the consequences often being detrimental to their wellbeing. The most common addictions vary depending on geographical region and demographic, but they tend to be nicotine, alcohol and drugs. The problem with better understanding these addictive behaviours, and helping people to overcome them, is that they often have many layers. According to Psychology Today, substance use disorders tend to increase the likelihood of other mental health conditions, such as depression and anxiety. This means when it comes to treating addiction, there's a hell of a lot to consider. Just as different people can experience different kinds of addiction in different ways, the road to recovery can be very different too. Some people can go through natural recovery on their own, others find support in a community or group therapy, others have clinical-based recovery, which can involve medication or different kinds of therapy. And many others recover for some time to then relapse days, months or years later. Although doctors and scientists are learning more about addiction every day, it's clear there's no one-size-fits-all approach. So how can technology help to make recovery easier and possibly even more effective? Well, it's still early days for wearable tech created to address addiction. There are few devices or solutions already on the market and some of the best ideas are currently seeking funding and approval, which is a lengthy process. But that doesn't mean there isn't a great deal to get excited about. Although the number of smokers in the UK has dropped to an all time low over recent years, an estimated 9 million adults still smoke. 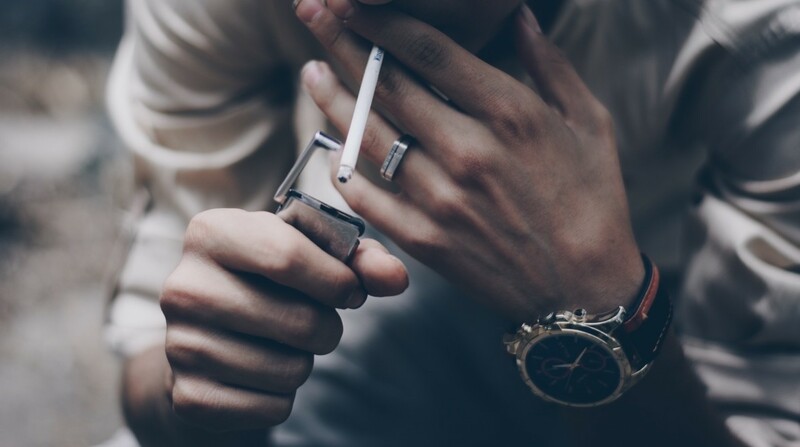 And as we all know, a smoking habit can lead to a number of health complications, not to mention cost thousands and thousands of pounds over a lifetime. Firstly, there are a lot of apps designed for smartwatches that are aimed at those who want to quit smoking, like Smoke Free for the Apple Watch and Stop Smoking for Wear. The method employed by most of these apps is tracking and awareness-building more than anything else, enabling people to monitor how many days they've gone without smoking and the money they've saved by quitting. Of course this is helpful, but might not be enough to kick a particularly serious and long held addiction. But downloading an app to your smartwatch isn't the only way you can use it to address your nicotine addiction. Somatix is working on a system called SmokeBeat, which puts the accelerometer and gyroscope within your wearable device to good use. It's able to use these sensors to identify and distinguish smoking from other hand to mouth gestures. It then provides insights to the person wearing it or a healthcare provider, as well as offering up a personalised programme based on Cognitive Behavioural Therapy (CBT) methods in an attempt to treat the addiction. The platform was recently put to a test in a study, which proved it was able to detect more than 80 per cent of smoking episodes in the test group. Importantly, it also determined that those using SmokeBeat's technology reported a significant decline in their smoking rate. Last year, a company called Chrono Therapeutics made headlines for its interesting take on tackling nicotine addiction with a system called SmartStop. The device uses nicotine replacement therapy (NRT) to deliver nicotine directly into a user's bloodstream in an attempt to regulate it and wean the user off it. When we spoke with Chrono Therapeutic's vice president of business development David Matly last year, he explained that the NRT is part of a 10 week programme that slowly lowers your doses. It's also combined with software that syncs up to your smartwatch, allowing you to log cravings, as well as receive reminders about why you're deciding to quit. Finally, there's a very different approach that claims to be able to overcome a smoking addiction and it involves mildly electrocuting yourself with up to 500 volts. Pavlok uses Pavlovian conditioning in a bid to stop people's bad habits in their tracks. It's based on a theory that suggests creating a cognitive association with a specific action over time can change your behaviour towards it. Pavlov originally got dogs to salivate at the ring of a bell by associating that sound with food. Pavlok works in the same way, but with your bad habits and an electric shock. We tested Pavlok back in 2016, but only for stopping nail-biting, which it did succeed in helping us overcome nail biting – so the idea is there. There's a whole wealth of research about the efficacy of this kind of aversive conditioning technique when it comes to bad habits, and the team behind the device claims to be able to help 70 per cent of those who smoke overcome their addiction. But a lot of these promising stories are anecdotal, so it's hard to say how it'd fare without a clinical trial that tests the wearable on those with a nicotine or drug addiction long-term. There are lots of misconceptions about drug addiction, one of the main ones being that those who are addicted to substances lack moral principles or willpower. But drug addiction is a chronic disease, and although in some cases the initial decision to take drugs is voluntary, repeated drug use can change the brain making it incredibly difficult to stop. As with many other addictions, a drug addiction can affect different people in different ways. Particularly as the term 'drug addiction' can cover all kinds of substances and medications that are likely to have different effects and present different symptoms. Up until now a lot of the technology and systems in place to help those with a drug addiction have been focused on aiding recovery. But one of the most interesting, and possibly game-changing, uses of tech to help people to better understand manage and potentially even overcome cravings is called virtual reality cue reactivity. A trial carried out at the University of Houston used virtual reality in an attempt to trigger heroin cravings in addicts. They put on a VR headset and were then presented with images that were perceived as triggering, like a syringe or a house party. Once these cravings were enhanced with the virtual images, they were given therapy and taught coping skills. The thinking behind the method is that using VR can invoke the cravings that therapists need to work with, but in a safe and controlled environment. Micki Washburn, a research scientist at the Virtual Reality Clinical Research Lab, told Lakeview Health: "Basically, what we're doing is an extension of exposure therapy for various psychological disorders. As therapists, we know that giving people a virtual environment that is as close as possible to a real environment enables us to teach them to withstand uncomfortable feelings that trigger the use of substances." We know what you're thinking – would VR really trigger that response? Well, a number of studies found that those with a nicotine addiction responded the same to VR smoking cues as they did to real life ones. The researchers felt that the findings would likely to translate to most drug addictions. Last year, we spoke to the team behind Behaivior, a system that really excited us because it uses cutting-edge AI technology to take a very holistic approach to helping people overcome their addiction. Behaivior is an AI system primarily aimed at treating those with an opioid addiction who might be prone to relapse. It can identify drug craving states in an individual in real-time and can then trigger an intervention. "Knowing in real-time when someone with opioid use disorder is at a high risk of relapsing or has overdosed will revolutionise the ability to intervene at the right moment to help people stay clean and sober and allow us to connect individuals to life-saving treatment and services," explains Behaivior co-founder Ellie Gordon. The team hope to expand the system over time, using contextual data from other connected devices and software to build a more comprehensive picture of a person's pattern of behaviour, for example, checking smartphone calendars to show a missed appointment could be an early sign of a relapse. Behaivior is one of the final teams in the IBM Watson AI XPrize, which is a tech competition funding innovative developments in AI. The team behind Behaivior understand the importance of identifying a relapse, and potentially even stopping one in its tracks, which has also been the thinking in a recent study by a team from the University of Texas about recovering from alcohol addiction. The team detailed their work in developing a way to detect high-risk drinking behaviour and alcohol-induced tissue damage with an ETG sensor, which measures sweat using wearable biosensors. You may think there are plenty of breathalysers and alcohol sensors already on the market, but the thinking behind this sensor is that it can detect just a small amount of alcohol after 24 hours, which could be useful for detecting relapses. As with smoking, there are plenty of apps for wearables that allow people to keep tabs on how much they're drinking, like Drinkaware for iOS and AlcoDroid for Android. There's also a wearable device called BACtrack Skyn, which measures the alcohol coming from your skin, giving you an indication of your alcohol level in real-time. But most of these solutions are for those who are casual drinkers that want to cut down on their consumption, rather than those who have a serious addiction. There are also apps that aren't so much about tracking your behaviour, but about keeping you on the right path once you're in recovery. WEconnect is an app designed for those in both alcohol and drug recovery, and is used after a clinical intervention. With its simple interface and bright colours, its aim is to help people stay accountable, rewarding them for days in recovery and providing them with instant access to important contacts. Although some of the methods focused on tracking and awareness building may not sound as effective as pain relief methods or employing tech to actually treat addictive behaviours, it's often the first step in helping people to understand they have a problem, as well as the ability to make real, lasting change. We spoke to Sally Baker, therapist at Working on The Body, who told us: "Through exploring and consciously acknowledging the steps that can lead to drug use or to excessive drinking, a client can see they have choices and at least at certain stages they could choose to affect a different outcome. "Along with therapy, these kinds of wearables and apps could help someone with addictive tendencies to use their increased insight into their behaviour to highlight pivotal times in their pattern of behaviour when they still have traction to make changes," she told us. "Tech could also be used to track and analyse the situations that usually lead to heavier drinking or drug use, and instigate a simple pattern interrupt technique to remind and empower them to make different choices." It may seem like a lot of the devices, apps and concepts here are focused on helping people after a relapse. To those not in the know, that may seem confusing. But although relapses can be devastating, they're sometimes a natural step in the road to recovery. Monitoring them, becoming more aware of them, understanding what triggered them and what they led to before seeking help can sometimes be the best way to 'treat' a relapse rather than the guilt, shame and further destructive behaviour that is often seen. But clearly the future of this tech is stopping a relapse in its tracks or curing addiction altogether. Although it's early days, with advances in artificial intelligence, like those from the Behaivior team, alongside advances in neuroscience, biometric sensors and virtual reality, there could be a new solution for addiction on the horizon. But maybe that's looking too far ahead – for now the focus needs to be on the rigorous testing of these ideas through clinical trials in order to prove their efficacy. That way they can move from the concept, research or initial funding stages and start to make real changes to people's lives.